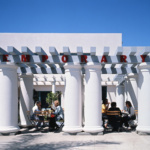 As postmodernism comes roaring back in the architecture world, the time finally seems ripe for many unfairly maligned buildings to receive their due respect. 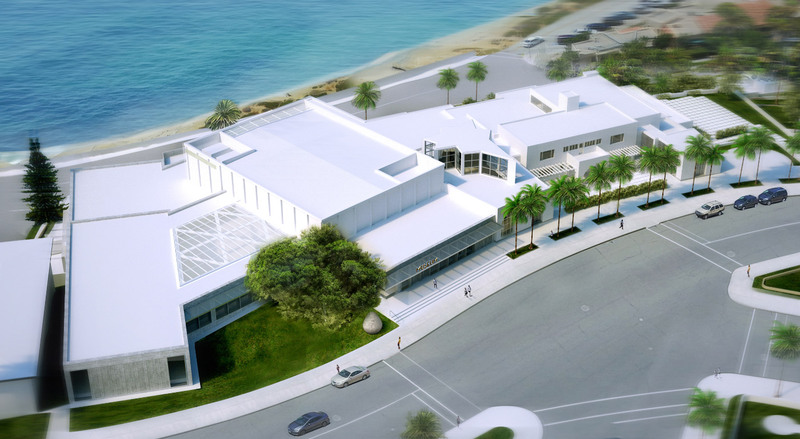 But at the San Diego Museum of Contemporary Art (MCA), the opposite seems on the verge of happening: A proposed concrete-and-glass expansion threatens to severely damage a lovely and highly functional building by Venturi Scott Brown and Associates (VSBA). The agglomerated museum of today—built in pieces between 1915 and 1996—mixes austere concrete with playful color, oversize plaster columns with powerful round arches, large signs and neon with an intimate courtyard. The original portion, a spare house by the California architect Irving Gill, gently tussles with VSBA’s surrounding addition; together, they embrace the tensions inherent in preserving a house within the context of a museum’s more monumental scale. 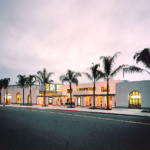 And yet the complex still manages to fit comfortably in its historic surroundings: a set of buildings also designed by Gill that together form a central green for the village of La Jolla. The proposed expansion, on the other hand, shows little interest in its surroundings. 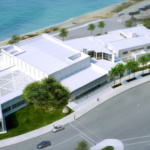 The work of New York City architect Annabelle Selldorf, it includes an interior renovation that would smartly turn the existing auditorium into gallery space with a pleasant set of oceanside terraces. But things go awry in the new galleries and glass-entrance atrium, which, in the architect’s zeal for a sort of Tadao Ando–inspired minimalism, end up missing out on an opportunity to contribute to the building’s richness. The most alarming proposal, though, is the removal of VSBA’s dramatic colonnade and, consequently, the courtyard that it helps to form. Selldorf argues that the colonnade obstructs views of the original house, but she overlooks the way in which its exaggerated scale both projects the museum’s civic presence and creates a sense of shelter that allows visitors to experience the house in Gill’s intended intimate setting, separated from the traffic out front. 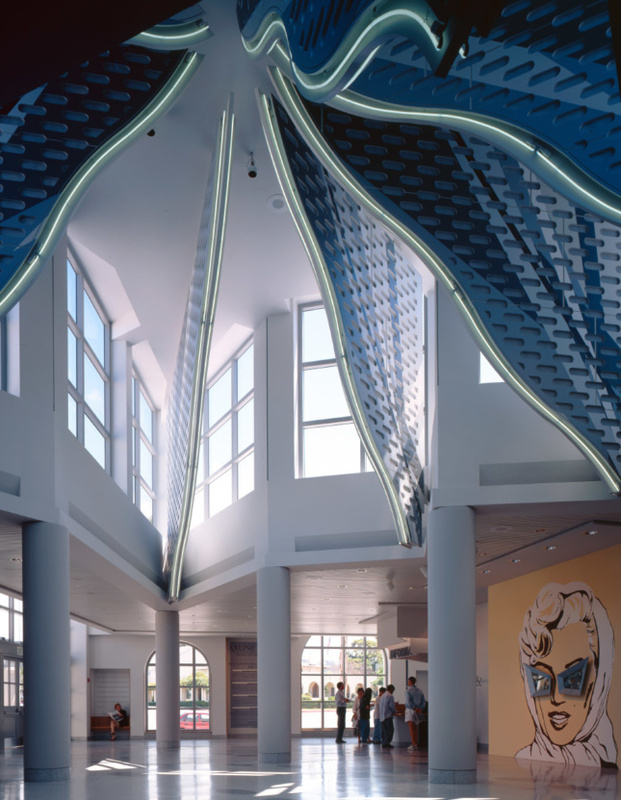 Visitors pass through the compressed courtyard on their way into the building—but then upon entering suddenly encounter the double-height explosion of light, neon, and brightly colored patterns that is VSBA’s iconic Axline Court. Under the new plan, the house would indeed be more visible from the road, but it would appear small and insubstantial, overshadowed by the later additions. Visitors would enter via the glass atrium then proceed directly into the new galleries, undercutting the importance of the house and making the Axline Court into a kind of curious afterthought. Both Selldorf and museum director Kathryn Kanjo say they want the court to remain lively, but given the proposed circulation—in which most visitors will only come across it at the back of the bookstore or after passing through three galleries—it’s hard to see what purpose it could serve. The sum total of the new plan would be a mishmash: an unhappy family of buildings that refuse to talk to one another all jammed together onto a single site. It would lose the crescendoing choreography of spaces that gives it vitality and order, as well the carefully considered relation to the town green. And not for any good reason: it would be quite possible—and substantially cheaper—to add galleries where Selldorf proposes without fundamentally detracting from the existing building. Unfortunately, such an approach would require an appreciation on the museum’s part of its architectural legacy that has so far not been forthcoming. Officials I spoke to seemed to have given little thought to the impact of the new project on the VSBA building, and when pressed on their thinking offered no particular reason that the existing circulation or aesthetics needed to be changed. 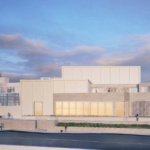 And the museum made only the feeblest of efforts to contact Scott Brown and Venturi about the plans—former director Hugh Davies says he left a single message at their office in 2014, though by that point they had been retired for several years and consequently never heard it. No follow-up was ever attempted; the duo were understandably surprised when I showed them the plans a few weeks ago. 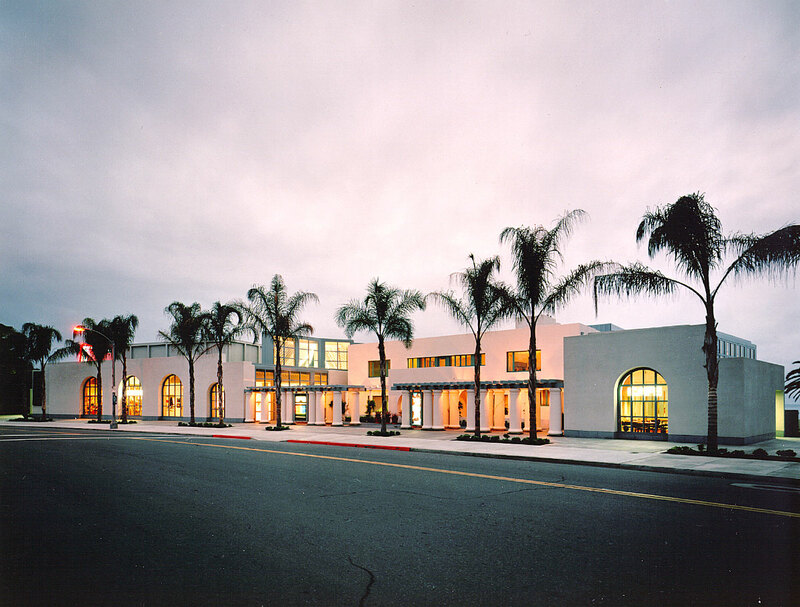 By contrast, when Renzo Piano undertook the renovation of the former May Company department store on Wilshire Boulevard in Los Angeles, he immediately contacted the office of the architects who designed it, A.C. Martin, and walked through his ideas with the firm’s current partners. Why are Venturi and Scott Brown, widely recognized as among the most important architects of the postwar era, not accorded a similar respect? The short answer to this question is simply that their work is unfashionable: too old to seem new but not old enough to have that nostalgic patina of “another era.” The longer answer is perhaps that architecture that engages the messiness of the world around it must fight an uphill battle for survival in the world of contemporary building—where architecture is too often seen as a formal game, as a matter of sculpting material and form with little concern for the complexities of place and identity. Too many of today’s architects and clients, not understanding the ethical imperative behind the VSBA mode of design, write it off as postmodern riffing—surface-level ornament without a coherent underlying order. But actually each element of the work relates to the larger whole—to symbolic meanings, to the physical and cultural context, to sequences of spaces. And in those relationships emerge subtle and sometimes even disconcerting distortions and juxtapositions—a traditional dome represented only through a bright neon outline in the Axline Court, an entry sequence that at first leads you toward the old front door of the Gill House and then suddenly turns you sideways. These moments allow us to look at the world a little differently: to see the familiar as strange and to reflect on what it means. 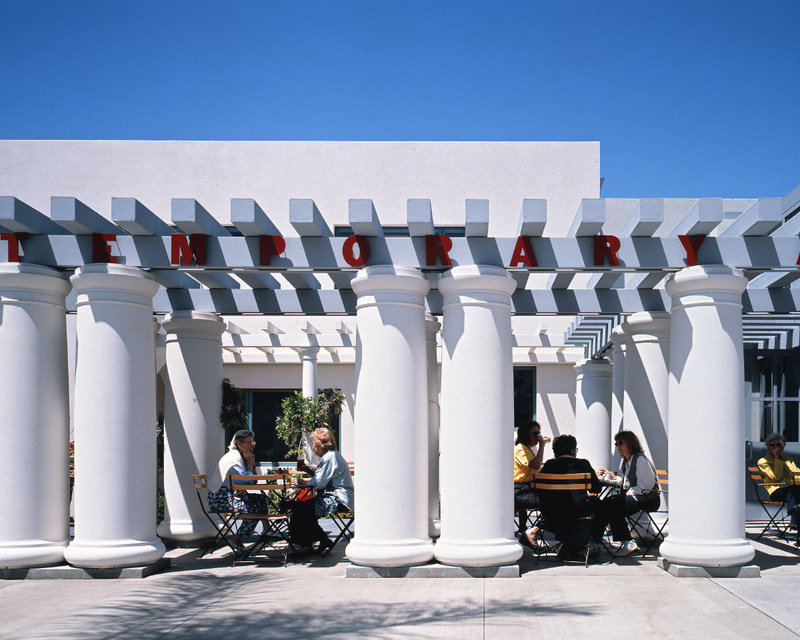 This powerful but difficult way of making meaning, so well appreciated in many of the artworks of MCASD’s collection, seems to offend contemporary sensibilities when it makes its way into architecture. Indeed, this is not the first time VSBA‘s work has been mistreated in a contemporary renovation. The 2007 expansion of their 1991 Seattle Art Museum by the minimalist architect Brad Cloepfil similarly disregarded a carefully orchestrated entry sequence, replacing it with—drumroll please—yet another generic atrium. Though the VSBA-designed building’s exterior was ostensibly left alone, Cloepfil’s hefty glass tower flatly declines to engage with it (or with the rest of its context, for that matter). Now the original building has taken on the feeling of an eccentric side wing wedged up against a chunky office block. At this point nothing short of a total renovation could set things right.